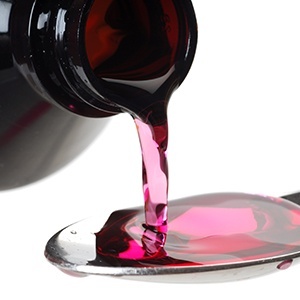 Cough mixtures and syrups are staples in the pharmaceutical industry, particularly for children and other individuals who cannot swallow tablets. Because they are liquids, however, these products face unique challenges in their production process. The mixing technology chosen for a given product will have a significant impact on its effectiveness and overall quality; here we analyze specific ways that the homogenization process will contribute to production of a high quality and effective syrup or mixture. Most cough mixtures and pharmaceutical syrups are comprised of emulsions, which are mixtures of two immiscible liquids. Critical to the drug’s ability to function is its chemical makeup, specifically around its ability to remain a homogenous mixture. High pressure homogenization not only emulsifies, but also stabilizes the particles to prevent separation of layers. Syrups and mixtures typically require at least one thickening agent to achieve the ideal consistency. However, these ingredients can cause agglomeration that cannot be dispersed by conventional mixtures. High pressure homogenizers, however, use mechanical forces along with pressure to achieve a smooth and uniform product, so can overcome this problem. Some mixing processes use heat, which can be effective when paired with appropriate products. However, the active ingredient in pharmaceutical mixtures can be damaged by heat, so temperature change should be avoided when possible. As indicated above, high pressure homogenization uses high pressure and mechanical forces instead of heat, which preserves the active ingredient and increases its bioavailability in vivo. Although smaller particle size is oftentimes preferred, it is a uniform product that actually creates consistency in patient outcomes. This is particularly important if the patient purchases product from more than one batch of syrups or mixtures. Most pharmaceutical mixtures are comprised of nanoemulsions; regardless of the particle size comprising your product, it is important to achieve consistent particle size across all batches. Are you in need of equipment to support synthesis of a pharmaceutical product? BEE International Technology is trusted by pharmaceutical researchers and lab managers around the world. We deliver an array of key benefits, such as production of nano/micro emulsions and dispersions and lipids and suspensions; these can be used for applications such as injectables, targeted drug delivery, inhalants, time release, anesthetics, and importantly, vaccinations. In addition, we have extensive experience in the challenges that our pharmaceutical customers face as they transition from concept, through to R&D, clinical trials, all-important FDA approval, and finally to manufacturing. As an employee of the pharmaceutical industry, you are probably all-too-aware of how difficult it is for a product to see success, no matter how innovative it is. That's why it's critical to have access to equipment that makes production techniques easier, in terms of time, cost, and product effectiveness. One example of such equipment is the high pressure homogenizer, which has numerous functions in the research setting. In this edition of the BEEI blog, we have compiled a list of important uses for homogenizers, specific to the pharmaceutical industry. Smaller particle size has been shown to confer enhanced function and increased bioavailability of pharmaceutical drugs. Frequently used products such as nutraceuticals, antibiotics, tablets, and vaccines require particle size reduction in their preparation; enhancing their biological function can therefore be easily accomplished in this step. Homogenization is the most popular method for particle size reduction due to its ability to achieve both small particle size and uniform consistency. These qualities can be hugely beneficial to pharmaceutical products, as they can increase bioavailability and chemical stability, make tablet ingestion easier, and enhance physical appearance. The pharmaceutical industry is a booming business because of the researchers who continue to discover innovative cures, treatments, and preventative regimens. The drug development process is not easy, however, and most products developed in the R&D stage never see the daylight of manufacturing. 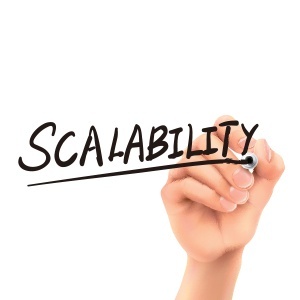 However, for those products that do make it to clinical trials and further, their success largely depends on the scalability of their technique. While many mixing methods exist, homogenization is impressively scalable, which can increase cost savings, lower time requirements, and decrease the product’s likelihood of failure. 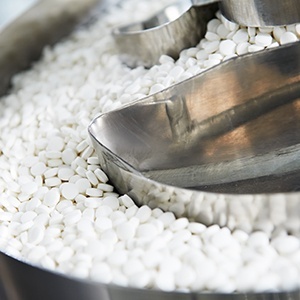 Molecules such as emulsions and dispersions are key to the development of many commonly used pharmaceutical products, and both can be easily produced through homogenization. Emulsions are mixtures of two immiscible liquids, and comprise oral and topical products. They work to mask unpleasant chemical taste, increase absorption rate, optimize viscosity, and enhance washability. In contrast, dispersions are comprised of finely divided solid particles dispersed in a liquid, and make up most oral, parenteral, and inhalant/aerosol products. High quality dispersions can minimize clotting, mask bitter tastes, improve chemical stability, and control drug release. 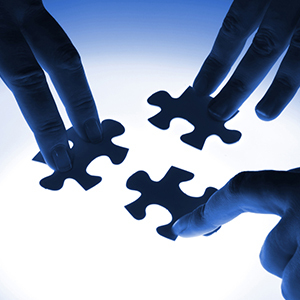 Are you in need of equipment to support synthesis of a pharmaceutical product? BEE International Technology is trusted by pharmaceutical researchers and lab managers around the world. We deliver an array of key benefits, such as production of nano/micro emulsions and dispersions and lipids and suspensions; these can be used for applications such as injectables, targeted drug delivery, inhalants, time release, anesthetics, and importantly, vaccinations. In addition, we have extensive experience in the challenges that our pharmaceutical customers face as they transition from concept, through to R&D, clinical trials, all-important FDA approval and finally, to manufacturing. Learn more by visiting http://www.beei.com/industry/pharmaceutical-process-equipment. The drug development industry is one of trial and turmoil. Only about 12.5% of products that enter clinical trials will make it to manufacturing, and an even smaller fraction will successfully move from R&D to clinical trials. (1) It truly is a shame to think that many of the products which consumers will never see held the potential for successful drug therapy. One way to ensure your pharmaceutical product does not meet this fate is by scaling homogenizer equipment, which is frequently used along the drug development process. Keep reading to improve your understanding of why scalability is important when selecting a homogenizer. You may be reading this from one of many perspectives: that of an independent lab researcher, in-house, or contracted by a large corporation. No matter the category you fall under, you are probably all-too-familiar with the fact that conducting research is incredibly expensive, particularly in the drug development industry. Particle size reduction via homogenization is frequently used in the pharmaceutical industry. The ability of this method to be scaled ensures that you can invest in a project with the confidence that it will still work on the larger machinery. Alternatively, if the method could not be scaled, significant monetary funds would be required to order more reagents and begin again at the small-scale level. By developing a scalable particle size reduction technique from day 1, significant amounts of time can be saved. Importantly, it is not just the technique itself that needs to be optimized; it is the equipment the technique is being used on that may determine its success. By using a particle size reduction on scalable equipment starting at R&D, the same technique should easily work on a pilot-plant homogenizer in clinical trials. No researcher wants to get stuck with an optimized R&D technique that doesn’t work when their product moves to clinical trials or manufacturing. As mentioned above, scalable equipment should be used from the start of R&D all the way through the manufacturing stage. Failure to do so will cost both time and money, as any technique that didn’t scale will have to be re-optimized on the lab bench. Importantly, if the equipment you have access to can support a scaled process, your chances of making it to the golden manufacturing stage are higher. 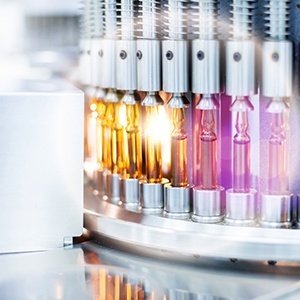 A number of homogenizer manufacturers have different models available for each phase of drug development; for example, BEE International is renowned for their homogenization equipment and ability to help a customer through the drug development process. They offer laboratory homogenizers for R&D, pilot scale homogenizers for clinical trials, and industrial homogenizers for the manufacturing phase. The scalability of these homogenizers- e.g., a method that was successful with the laboratory homogenizer will also be successful with the industrial homogenizer- is a huge benefit that can save both time and cost. 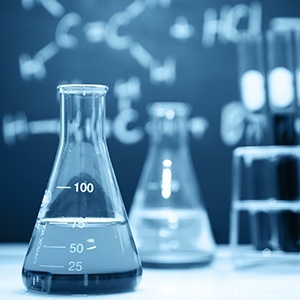 Although this writing focused centrally on the pharmaceutical industry, homogenizers are frequently used in the chemical, biotechnology, and food & beverage industries as well. BEE delivers an array of key benefits to each industry, such as production of nano/micro emulsions, dispersions, lipids, and suspensions. When selecting a company that offers scalable particle size reduction equipment, begin with BEE; not only do they manufacture the highest quality equipment, but they also offer customization and proprietary software to help optimize processes. Regardless of your end goal, if you are lysing cells you are likely looking to extract intracellular contents. However, some cell types lend themselves easier to this process than others. 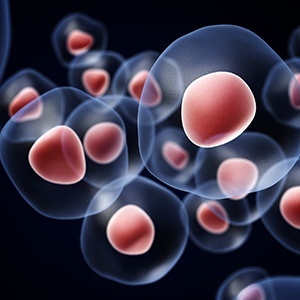 Fungi, yeast, and bacterial have tough cell walls that must first be penetrated; these will therefore confer additional steps compared to an animal cell, whose easy-to-penetrate cell membrane is the only barrier between you and its intracellular contents. Scientists have the option of using either non-mechanical or mechanical methods of cell disruption. Non-mechanical methods include enzymes, beads, sonication, and detergents; these are advantageous in that they typically require less equipment and only simple reagents. However, non-mechanical methods are best for small sample sizes, and would likely be overwhelmed with a larger sample size. In contrast, mechanical methods such as rotor-stator and valve-type processors, have in common the use of high pressure and better ability to handle large sample sizes. Your laboratory’s specific lysate and product needs will dictate whether a mechanical or non-mechanical method is the best fit. Interestingly, using a sample size that doesn’t match the method can be one of the most significant errors you make. Small sample sizes, commonly used for R&D and independent research, can easily produce a pure intracellular product. 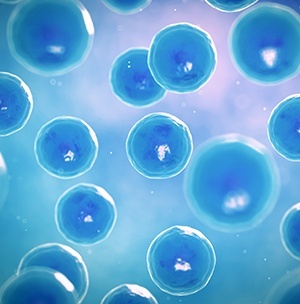 However, a larger sample size may pose difficulty in terms of reproducibility and purity of product, particularly when using non-mechanical methods of cell lysis. Homogenization is one of the only methods that achieve a uniform and pure product for both small and large sample sizes. Use of a homogenizer to lyse your samples will provide numerous benefits, some of which were touched on above. And there are plenty of homogenizers on the market to choose from. However, the lysate can be of higher quality and more even consistency when run through a top-shelf homogenizer. BEE International Technologies is trusted by researchers around the world for both their laboratory homogenizers and their associated customer support. Cell lysis is just one of a variety of applications for BEEI homogenizers; nano/micro emulsions, lipids, suspensions, and dispersions are also easily achievable. Additionally, the homogenizer processes can be controlled to suit your product, which will allow you to customize to your cell type. And finally, the equipment is easy to use, produces higher yield in less time, and achieves results that are reproducible and scalable. When I think back to my college chemistry classes, I recall wondering how humans know so much about molecules that we can’t even see; I thought that the researchers behind these findings were amazing! As a working professional in the science field, I now know that I was right- those researchers truly were and are extraordinary individuals. But they also had access to chemical processing equipment that made their jobs easier in terms of both time and accuracy. In particular, the diverse and essential function of homogenizers makes this piece of equipment indispensable in any chemical laboratory or plant. Read on to better understand how having a homogenizer in your laboratory will benefit your chemical process. When selecting a high pressure homogenizer for chemical processing, it is essential to choose a company and model that will provide you with high quality output. Those on the higher market end will reduce the particle size of challenging materials; although most homogenizers can reduce particle size, only the best will process challenging materials, oftentimes in very few passes and with uniform output. These decreased particle sizes correspond with increased surface area, a valuable quality in chemical reactions. In addition, homogenizers are beneficial to researchers who are either trying to replicate old processes or experiment with new processes. For example, the equipment can preserve existing particle morphologies or alternatively yield new and unusual particle morphologies. Finally, a high quality homogenizer should provide you with high aspect ratio, one-step blending and formulation, purification, and an accelerated chemical process, any of which is critical to successful experimentation. Ideal dispersions and finer particles are, as described above, significant functions of a chemical processing homogenizer. By attaining these, you can expect to see maximum particle packing, better particle coating during formulations, increased conductivity, smoother surface quality, and finer printed features. A variety of industrial products can benefit from these characteristics; just a few include polymers (e.g. acrylic emulsions, solutions and dispersions, urethane prepolymers, and solvent-based emulsions), pigment and ink dispersions, carbon nanotubes, additives, resins, adhesives, and pastes. In 2015, nearly 15% of people worldwide used a pharmaceutical tablet; add half a billion people to that statistic and you have the 2018 estimates. (1) The pharmaceutical tablet market is booming, with no sign of letting up in the near future. Researchers involved in the ingredient production process must therefore select ingredients that will help their product stand out in an already saturated market. In this post, we tackle the excipient ingredients, specifically the sugar sphere and four key advantages of using it as a tablet core. Sugar spheres are porous pellets that are typically composed of sucrose and starch. Comprising a tablet’s core, the pellets are blended with other tablet ingredients, such as active pharmaceutical ingredients (APIs). Because they are most commonly found in sustained release tablets, other excipients may also be found in the mixture. Its spherical shape is ideal due to its flowability, particularly when being poured in bulk. Additionally, after blending the pellet with APIs and other excipients, compression of the newly-formed tablet occurs; this process is easier and more efficient with a spherical pellet. To ensure uniform application of APIs, sugar spheres particle size should be closely distributed. The international sieve series defines μm limits for particle size based on American Society for Testing and Materials (ASTM) standard sieves. A wide range of particle sizes are available on the market, which is hugely beneficial to laboratories that require a variety of sizes for different tablets. Once you have sugar spheres available for use, layering of APIs and other excipients over the pellet can take place. This process requires use of a high quality laboratory homogenizer, which can have downstream effects for the consumer, including ease in swallowing, visual attractiveness, and appropriate internal release. BEE International Technology, maker of laboratory homogenizers, is globally renowned by laboratory managers and researchers. We produce homogenizers that can yield a variety of relevant products, such as emulsions, suspensions, dispersions and lipids. Importantly, these products and more are incorporated into sugar sphere-based tablets described above. In addition, BEEI has extensive experience assisting its product users as they transition through the drug manufacturing process. Have you ever purified protein or cellular organelles? How about extracted DNA or RNA? If you answered yes to any of these, you are probably well-acquainted with at least one cell lysis method. But were you using the optimal method for your specific cell type? Below are listed a variety of cell types matched with the cell lysis method that will derive the highest quality lysate. Without a tough cell wall, mammalian cells need a method that is effective enough to disrupt their plasma membrane but gentle enough to keep the intracellular contents intact. Therefore, mild detergents with low concentrations of protease inhibitors, or freeze thawing in some cases, are typically sufficient. The powerful cell wall comprised of cellulose and polysaccharides makes plant cells difficult to penetrate. Manual lysis via mortar and pestle is therefore one of the quickest and easiest ways to access a plant cell’s intracellular contents. Most of the cell types listed above can be easily lysed with a homogenizer, regardless of the sample volume. However, the lysate can be of higher quality and more even consistency when run through a top-shelf homogenizer. BEEI is trusted by researchers around the world for both their laboratory homogenizers and their associated customer support. Cell lysis is just one of a variety of applications for BEEI homogenizers; nano/micro emulsions, lipids, suspensions, and dispersions are also easily achievable. Additionally, the homogenizer processes can be controlled to suit your product, which will allow you to customize to your cell type. And finally, the equipment is easy to use, produces higher yield in less time, and achieves results that are reproducible and scalable. The E. coli pathogen is responsible for approximately 96,000 foodborne illnesses and $405 million in healthcare costs every year. (1) Yet in spite of its negative image, this bacterial species plays a critical role in laboratories around the world. Specifically, its cells can be ruptured to expose the intracellular contents for numerous applications. Although multiple cell lysis techniques exist, liquid homogenization is the most popular for cultured cells like E. coli. 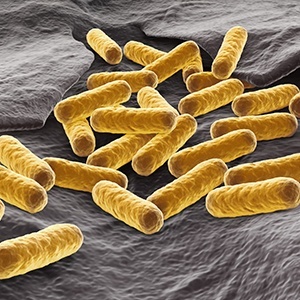 Here is a complete guide to E. coli cell rupture via homogenization, including the equipment you will need, methods and processes, and accurate analysis. Although specific methods may change based on the homogenizer and application, most samples will require some form of pre-homogenization treatment and post-homogenization cooling. Many homogenizers, such as the BEE International (BEEI) laboratory homogenizer, can be adjusted to optimize results, particularly across cell types and processes. For example, cavitation, shear, and impact are forces that are critical to successful cell rupture. BEEI homogenizers are structured so that the researcher can adjust these forces to be more gentle or harsh to produce the desired effect. In this way, the optimum results for high yield cell rupture are achieved for the widest variety of cells. Analysis of the disruption must take place as close to conclusion of homogenization as possible for an accurate reading. The sample can be viewed with a bright-field or phase-contrast microscope. In additional to its observational strengths, phase-contrast allows the user to gather information on particle size and its impact on downstream processes. The homogenate can then be sedimented to determine protein concentration; these results are to be compared with protein concentrations of prior passes to determine if additional passes are needed. Although a qualitative assessment of particle size can be obtained through a phase-contrast microscope, a quantitative process may be required, specifically in the context of product optimization. Several processes exist to accomplish quantitative analysis, cumulative sedimentation analysis (CSA) is more reliable and requires materials typically found in a laboratory. As your laboratory prepares to run and analyze cell disruptions, you will begin looking at homogenizers that best suit the required needs. BEEI is trusted by pharmaceutical researchers and lab managers around the world. We deliver an array of key benefits, such as production of cell lysates, nano/micro emulsions and dispersions and lipids and suspensions. Our homogenizer processes can be controlled to better suit your product; for example, pressure can be adjusted to be gentler or harsher and the results can be scaled to manufacturing. Finally, our equipment is easy to use, produces higher yield in less time, and results are reproducible and scalable.